If you are moving out of the area, my realtor friends will take good care of you, but contact me first so I can properly introduce you and your needs & wants in a new home to them. Allowing me to follow up on your progress! If you are a Realtor and would like to exchange links, please place the following information on your website. E-mail YOUR information to realtor@joeinboise.com and I will link to your site. 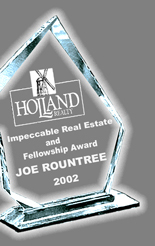 Joe Rountree ABR, GRI, CSP, E-Pro has been a top producer in Boise, Idaho and the surrounding area since 1994. If you are thinking about moving to the Boise area, contact Joe and request a free relocation information.